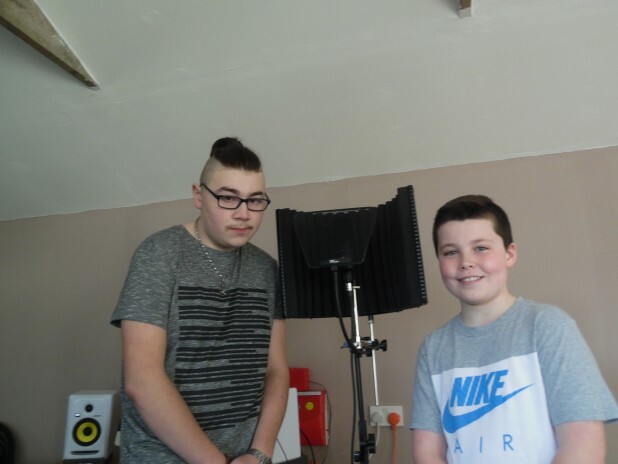 Its Thursday 10th March at a studio in Finglas, a housing estate north of Dublin City, owned by Cale Smith, a native rapper from Finglas, two young men by the name of Clayton Cooper, and James Moran, give us an opportunity to see something very new, when it comes to rapping. Clayton Cooper is just 12 years old, and already has a lot going for him. He has a couple of songs up on sound cloud, that he did as solo. Not put off one bit by his age, he shows no sign of been nervous and just raps full steam ahead. Clayton known as Clayto, is a 6th class student, he is probably one of the youngest rap artists that I have ever met. His pal James Moran, is a few years ahead of him at 16, and is at his last stages of schooling days. James is the very first “Beatboxer” I have ever heard. They put on a mini show for me, and I was just taken back by them. I have never heared anything like it before yesterday, and I just totally loved it. The pals both from Finglas, met at a music club ran from FRYC (Finglas Youth Resource Centre). They formed “Newkind” and have already worked on their very first single called “Dedication”, which will be released on a CD format in the very near future . Despite only forming last year, they have had a few gigs, one at the Helix, in Ballymun. I asked Clayto where he gets his inspiration from, he said 2 Pac, 50 Cent, and of course, Eminem. I asked James the same question, and he replied KRNFX, who is a forigen Beatboxer, from Korea, and 80FitZ, who hails from the USA. I asked them what advice would they give any other artists, James replied ” Do What You Love & Love What You Do” and Clayto said ” Never Doubt Yourself You Can Always Do It, It Takes effort & Commitment”. Good advice for young shoulders! As I pointed out their single “Dedication” which is produced by B Starr, will be out shortly & they hope to have a video released with it. I asked them where would they like to be in 10 years from now,Clayto, and James said selling out arenas such as a Super Bowl, in the USA, they would both like to have a few albums out, and some EPs, plus national and global fan bases. So very little ambition there then! From what I seen yesterday, these two young men from Finglas, can do it, they have what it takes, their act is new, and they can bring this act up to the next level of their game. We all need to get behind ” Newkind ” and other up and coming Irish musicans and artists and give them their 100% , support what they truelly derserve.